Bossy Italian Wife : Quick Fix: Peanut Butter & Banana "Ice Cream"
Quick Fix: Peanut Butter & Banana "Ice Cream"
I have a hearty sweet tooth now, which is something I am learning to deal with. First, I tried a gluten free (almost vegan) cupcake recipe, which was really awesome. Now, I'm on to ice cream. I saw a picture on Pinterest that peaked my interest and I thought I would try it....this recipe basically uses frozen bananas to make a very ice cream-like frosty treat. This sucker is dairy free. And it's gluten free. And there's no added sugar, unless you count the peanut butter, which I guess you could. I added a hint of cocoa powder for a little chocolately kick in the pants and POW, awesome dessert. Okay, well, I had this as an afternoon snack, but whatever. You can eat this any time of the day you want to. There are no rules here. What I can tell you is that it's so easy you will be astonished. And it solves that problem of "what do I do with these extra frozen bananas in my freezer?" Does anyone else have this problem or am I just strange? Don't answer that--it's probably a little of both. I have just been looking for a reason to use these bananas. I cut them up into pieces and threw them in my food processor. Oh, and I added 1/4 cup almond milk. And then I whipped it good until it was smooth! Then I added a healthy dose of peanut butter...no measuring necessary on the peanut butter, just add what you feel. I think it was about 1/4 cup, but really it was just the bottom of the jar and I used it up. And 1 teaspoon of cocoa powder. YUM! All blended together and looking fine! Seriously...that was too easy, wasn't it? I threw two scoops into my bowl and topped it with some chocolate chips because no one was looking and I was feeling sassy! This was the perfect treat!!! I saved the rest in the freezer and used it to impress my husband with my awesome skilllllllllz. Skillz with a "z!" 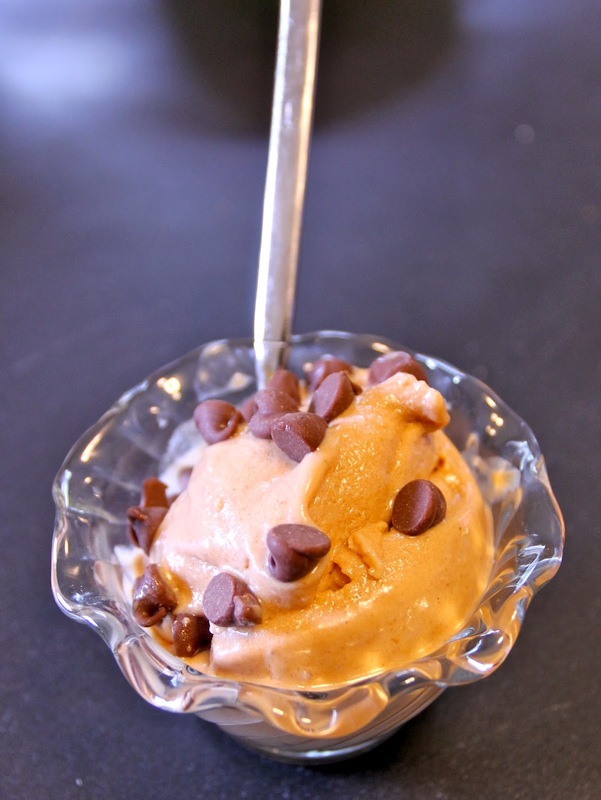 Peanut Butter & Banana "Ice Cream"
Time: 5 minutes | Makes: 4 (ish) Servings | Difficulty: Super Easy! Slice your frozen bananas into pieces. Add your sliced bananas and almond milk to your food processor. Process until smooth. Add your peanut butter and cocoa and process until blended. Serve all by itself or with a topping of shredded coconut and/or chocolate chips! Store leftovers in the freezer! What Exactly Makes a "Young Mother?" ERMAGERD....There's Yoga Mats In Everything!